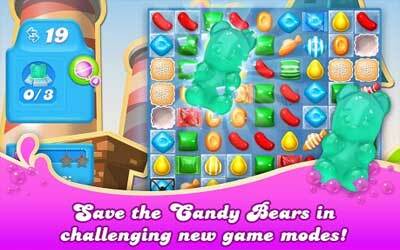 Previous version Candy Crush Soda Saga 1.80.5 apk for Android will help you to downgrade or install older app easily. This is one of the best Casual apps. There are more than 250 levels and new game modes. There are 3 new game modes include Soda, Frosting and Honey. Each game mode offers the different challenges to the players. Beside it, there are new juicy environments and mouth-watering new graphics as well. And just like the previous generation, the game is still easy to play and addictive. It is free to play. You can install it and play it for free. But as an in app purchase game, players can buy special items with the real money as well. The price of the items are various from a dollar up to hundreds dollars. If you want to go to the next generation of the saga, this is a game to try. Candy Crush Soda Saga is also pretty small. You do not need a high specification device to play it. Dive into the world of Soda in our fizzy new episodes! Ms. Sugar Snout has had a bit too much sweet tea and can’t stop saying: ADORABLE! Brewmaster Pan is holding a traditional tea ceremony. Join Kimmy for some sweet tea and cake. It’s a matcha made in heaven! Addictive game. I have had no real issues with this game! Just wish it had the prize wheel like candy crush.